The idea for the checklist grew out of a meeting with the National Telecommunications Safety Panel in which NATE representatives underscored what continues to be the largest safety issue facing the industry – the use of unqualified contractors. Carriers represented at that meeting were informed of how this issue has plagued the industry, and the need for active steps to be taken to address it. 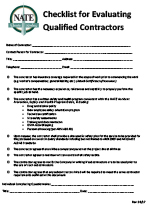 Unqualified contractors have an obvious advantage in gaining work in the industry. They are able to underbid their safety conscious competitors who have invested in training, practices, procedures and proper equipment for their employees. Furthermore, situations featuring multiple layers of contractors can create the impression that safety is a priority, but beneath the surface, as work is subcontracted out, the company who can do the job cheaply can still underbid the company who will do the job right. The Checklist for Evaluating Qualified Contractors was primarily designed to serve as a tool to help carriers evaluate a contractor’s dedication to safety. There have been suggestions that NATE members may also want to submit these forms with their bids to demonstrate that they are meeting practices recommended by their association. As with the Tower Owner Safety Guidelines, the Checklist for Evaluating Qualified Contractors is not a legally binding document, but rather one additional method of helping improve safety on the job site by demonstrating qualities to which reputable contractors will adhere. We hope our members will share this list with their clients, and encourage them to hire only those companies who are prepared to work safely.